This is becoming a habit, I think. Yet another Italian mad scientist has blended a small amount of lambic into their beer. This one has its roots in Drie Fonteinen's infamous "Thermostat Incident" in which much of their stock was lost. In need of a quick infusion of cash, Armand Debelder sought to sell off his remaining lambic barrels as quickly as possible. Enter Birrificio Del Ducato, which was more than happy to take up the call. Alas, that batch was many moons ago and these days, they use lambic from the more readily available Oud Beersel. 18% of this is 18 month old lambic (I see what they did there), with the remaining 82% being one of their standard spiced saisons, Nuova Mattina. But, you know, if you're going to blend something into your beer, lambic seems like a better choice than a lot of the weird stuff we're seeing from "innovative" breweries these days. I mean, yeah, sure, I want to try that beer made with ample helpings of Cheeto dust*, of course I do, but it's more out of morbid curiosity than because I think it will taste good. This lambic blending thing, though, is something that is promising, if a bit difficult to tame if my experience is any indication. Beer Nerd Details: 6.2% ABV bottled (750 ml). Drank out of a charente glass on 4/2/16. Near as I can tell, these bottles seem to be a little inconsistent in terms of the carbonation. Some folks get bottles like mine, others are well carbonated. This is pretty expensive too, so it's a bit of a gamble. Caveat Emptor! Ducato makes some decent Belgian style beer though, and the base for this beer is quite nice. * Too my knowledge, this beer does not exist. Yet. Though I'm positive some enterprising homebrewer has tried it. This page contains a single entry by Mark published on April 6, 2016 10:25 PM. 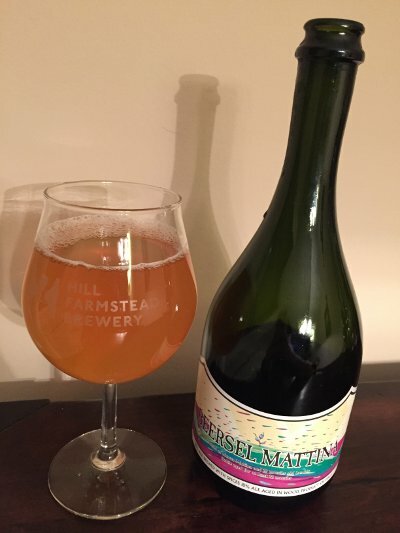 Tired Hands Bottle Digest was the previous entry in this blog. FiftyFifty Eclipse Grand Cru is the next entry in this blog.